How good is BBQ salmon? Somehow it doesn’t taste as rich to me when BBQd. Pair it with a really simple quinoa salad & you’ve got an easy dinner for 1. 2/3 cup (when uncooked) quinoa – I used tri-colour but whatever floats your boat. 1 lemon – zest the whole thing (thanks Microplane for making this easy! ), then juice it. 2 cups lettuce – the darker, the more nutrient rich. Optional: we happened to have some slow-roasted baby tomatoes in the fridge which I added – really not essential….& in fact I’m not even sure the sweetness was necessary. PLATE UP, THEN EAT UP! 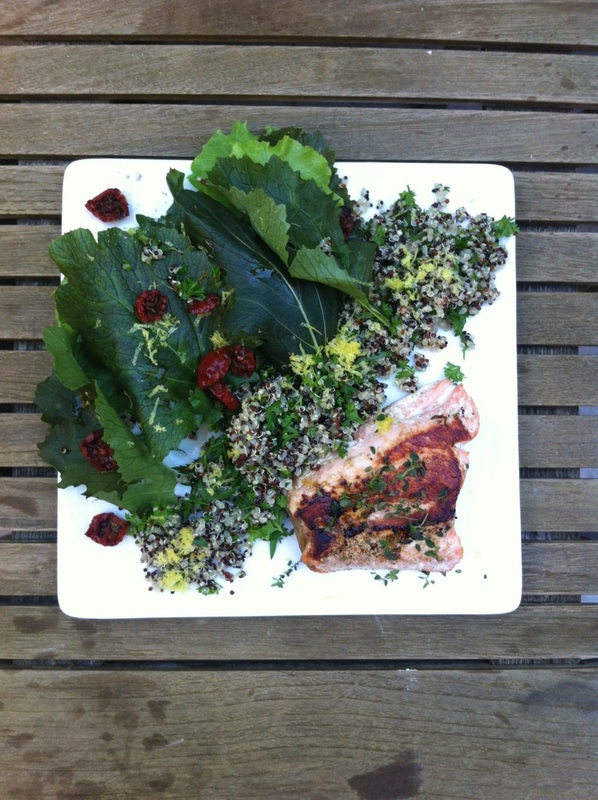 This entry was posted in Recipe and tagged dairyfree, dinner, glutenfree, iqs, Quinoa, refinedsugarfree, salmon by 6 Clean Ingredients. Bookmark the permalink.